Summary: Gulf County is located in Florida's panhandle and includes 43 miles of coastline. These beaches provide necessary resources for nesting marine turtles. The greatest number of nests is deposited in Gulf County is by loggerhead sea turtles. In addition, the number of green and leatherback turtle nests laid in Gulf County has increased in recent years. Although Gulf County supports large numbers of sea turtle nests deposited by a significant group of turtles, this area has just recently begun development of education programs designed to inform residents and tourists about these species. Although dedicated to providing solid education, the County also faces many significant limitations. The County has no specific budget for sea turtle conservation or education. Currently, there is no ordinance restricting the placement of beach equipment during the day or at night and the County has no educational materials available at this time to provide to homeowners or rental agencies about effects of beach equipment on nesting and hatchling turtles. The goals of this project are to provide Gulf County with education materials that address three general needs: lighting, beach equipment, and general knowledge. These goals will be met by providing 1. educational lighting packets; 2. tags that can be placed on beach equipment providing information and asking for nightly removal; and 3. educational signs for public beach access points and major entrance roads. Results: Two large signs were purchased. One sign was placed on County property bordering Highway 98 in St. Joe Beach and the other was placed on County Road C-30E at the entrance to Cape San Blas Road. The St. Joseph Bay Buffer Preserve also owns one large sign identical to those purchased with these funds and this sign is being installed on County Road C-30A towards Indian Pass. This means that all traffic headed to the beaches in Gulf County will be exposed to this signage. In addition, 20 smaller signs were purchased. These signs were framed by the Gulf County maintenance Department. 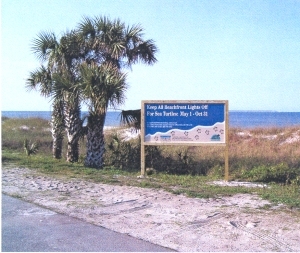 One sign was installed at every beach access point in Gulf County ensuring a consistent and concise message to each beach user.